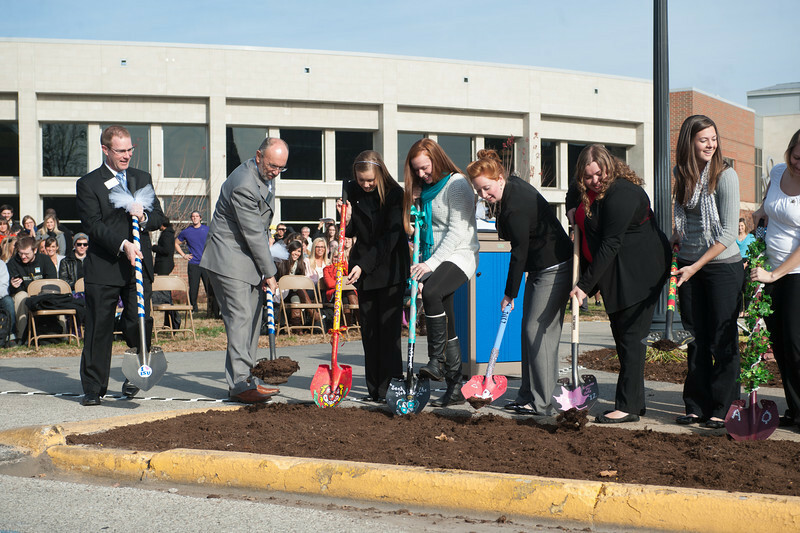 For the first time in more than 40 years, Indiana State University is building a new residence hall on campus. The North Residence Hall will be south of Lincoln Quad and just north of Hulman Memorial Student Union in an area currently used for parking. Students joined university officials, Terre Haute community leaders and contractors in a ceremonial groundbreaking on Thursday. "It's prime real estate. It's close to the union, academic facilities, library, Rec Center and athletic facilities. For students, it's a convenience factor," said Brooks Moore, associate dean of students. 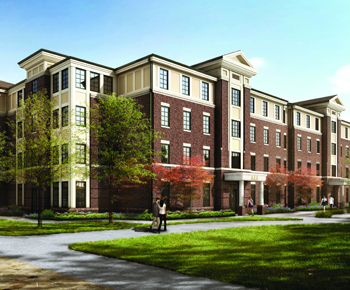 The North Residence Hall will feature eight small group housing units to accommodate a total of 352 students. While physically connected, each unit will have its own separate entrance and living space. Inside, residential spaces will range from double occupancy rooms for underclassmen to single rooms for seniors. "The goal is to provide autonomy for each of the eight groups living within the facility by providing them their own ‘house' while still maintaining the connectivity amongst all the groups," said Tara Singer, assistant vice president for Communications and Marketing at ISU. The housing is designed for use by small groups, including student organizations, living learning communities and Greek communities. Brooks Moore, associate dean of students, offered an example of how the new housing could add to a student's experience in Greek life. "Supplementing a healthy, vibrant sorority community will be a new living environment," said Moore. "The housing will make it that much more attractive for women to say, ‘Yes, I want to join an organization, get involved and live in a residence hall,'" he said, adding that current sorority members and alumni have expressed excitement about the project. Amenities will include individual kitchens, storage spaces, social lounges and patios for each area. In addition, ISU plans to integrate sustainable features such as the use of regional materials with high recycled content, energy efficient mechanical systems and low water usage plumbing fixtures. University officials expect the estimated $21 million project will be completed by April 2014 and ready for use that summer. Funding will come from the issuance of long-term debt and reserves of the university's housing and dining system. CSO Architects of Indianapolis served as designers on the project with contractors Hannig Construction and Crown Electric of Terre Haute and Huber and Sons Plumbing, Heating and Air Conditioning of Greencastle. The construction is part of the Housing Strategic Master Plan, a long-term plan to update campus h ousing. "The continuing renovations have not only made conditions better for our current students, but we know that they are helping attract new students to ISU as well," said Samier Ishtayeh, an ISU student and president of the university's Resident Hall Association. Rex Kendall, who recently moved to a position as Alumni Association director with the ISU Foundation after serving as director of residential life, said he is excited about the amount of student input on the project. Student focus groups met with architecture teams, administration teams and ISU leadership to offer their ideas. "We asked for their input about what they would like to see in terms of room size, number of occupants and room design. A lot of those ideas were implemented and put into practice," he said. Adding more customization, student groups will have the opportunity to decorate the interior of their units as well. Overall, Kendall said he believes the new housing will add to the success of students at ISU, citing research showing students who are connected on campus to be the ones retained at a higher level. "It's not always about the higher GPA," he said "Students have to feel connected for them to be successful on a college campus. Living on campus will allow you to make those connections that you're not going to get otherwise." Photo: http://isuphoto.smugmug.com/photos/i-8vWm2vm/0/L/i-8vWm2vm-L.jpg - An architect's rendering of the new North Residence Hall at Indiana State University. The new eight-unit complex is scheduled for completion in spring 2014. Photo: http://isuphoto.smugmug.com/photos/i-LQXHKPF/0/L/i-LQXHKPF-L.jpg - An architect's rendering of the new North Residence Hall at Indiana State University. The new eight-unit complex is scheduled for completion in spring 2014. A new $21 million North Residence Hall complex will feature eight units and house a total of 352 students when it opens in summer 2014.